Communications campaigns can help you reach and engage the target audience and maximize the opportunities for success. 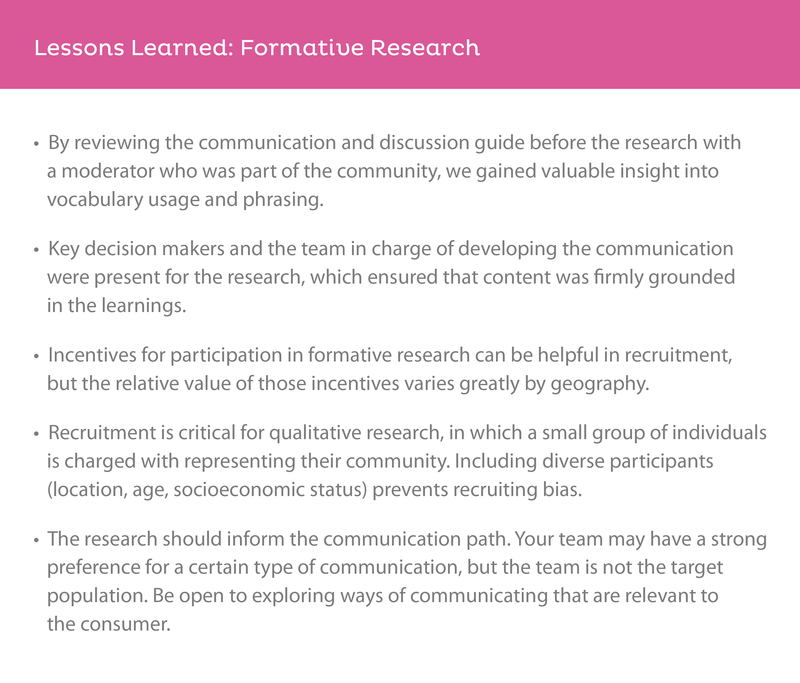 4.1 How can formative research help you develop a communication campaign strategy? Effective health communication campaigns are informed by formative research. 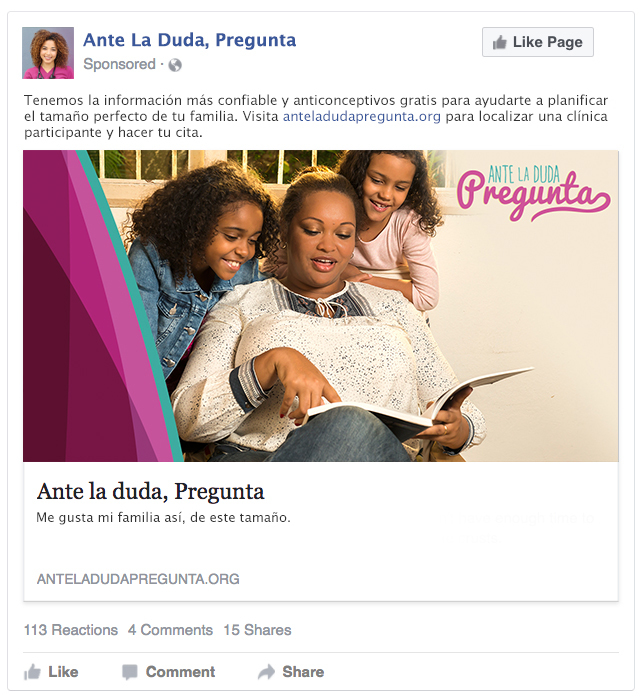 Formative research helped provide a foundation for the Ante La Duda, Pregunta (ALDP) (When in Doubt, Ask) Campaign which supported the Z-CAN Program. Formative research enables program providers to understand the needs of a target population and their current behavior (including the values and beliefs that influence their decisions and actions), how to reach and engage them effectively, and identify existing programs or gaps. Formative research, which can be conducted prior to launching a program or to improve an existing program, can include qualitative methods such as focus group discussions or one-on-one, in-depth interviews, and quantitative methods such as surveys. The research findings then inform the communication strategy, creative platform, development of messaging, and engagement tactics. 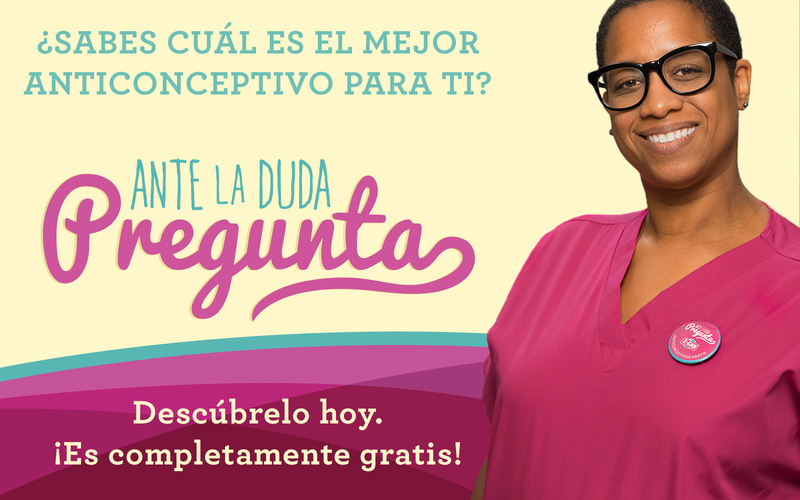 Formative Research: Through focus groups, a qualitative assessment was conducted in Puerto Rico among women and men of reproductive age (18-49) who chose to prevent or delay pregnancy for any reason. A total of 10 focus groups (eight with women and two with men) were conducted with participants who represented all socio-economic levels. Research revealed that focusing solely on reducing severe birth defects associated with the Zika outbreak would not be sufficient to motivate the target population to seek birth control to prevent unintended pregnancy. Women valued being informed about contraceptives, but they did not always engage their doctors in a thorough discussion about the most effective birth control methods. In fact, they did not know the important questions to ask about contraception or Zika or were uncomfortable asking them. Instead, they typically turned to their social network (usually their mothers or friends) for advice about their experiences, which became a blueprint for the women’s own decisions. 4.2 How should we define the target audience? During formative research you might talk to a broad group that represents the target population, but once you are developing messages, define your target as narrowly as possible (age, life stage, lifestyle, affinities, perceptions/barriers, media habits, and other key characteristics). As you narrow your audience to enable more effective targeting, consider who is the most receptive, who represents the greatest challenge, and who influences the audience you want to reach. We needed to have a clear understanding of Puerto Rican women of reproductive age 18–49 who chose to delay or prevent pregnancy. Through the formative research, we identified four different lifestyle/life stage segments in the reproductive age group with potentially different reproductive concerns: young college-aged women, single professional women, recently married women, and women who already had children. We developed messaging for each segment, tailoring messages to highlight specific concerns, questions, method types, or scenarios that were more relevant to these specific segments. Once you have a clear picture of your target audience, you can map their journey. Journey Mapping means understanding where and when the intended audience goes for information, when they have their greatest need (or the highest level of anxiety), and what stages they go through to make their decision.  As you map the consumer journey, consider the behaviors that an individual or community undertake that demonstrate a positive change toward the desired behavior; use those to identify types of communication that will help influence that positive movement and ultimately help measure a positive change toward the desired behavior. 4.3 How should we develop the campaign strategy and messaging platform? Team Assignment: Assembling the right cross-functional team to develop the campaign platform theme, the campaign plan, and all the necessary elements is the next critical step. The best teams include a mix of creative thinkers, detail-oriented implementation managers, and subject matter experts. You will use the Communications Brief (and any other pertinent project background) to kick off the Creative Process.  Creative Process: The goal of the creative process is to explore a range of platform concepts (an umbrella campaign theme that ties all the communication together) representing different pathways to change a behavior. After the team selects one concept, based on a pre-established review process and potential audience testing, the platform will serve as the springboard for all communication. 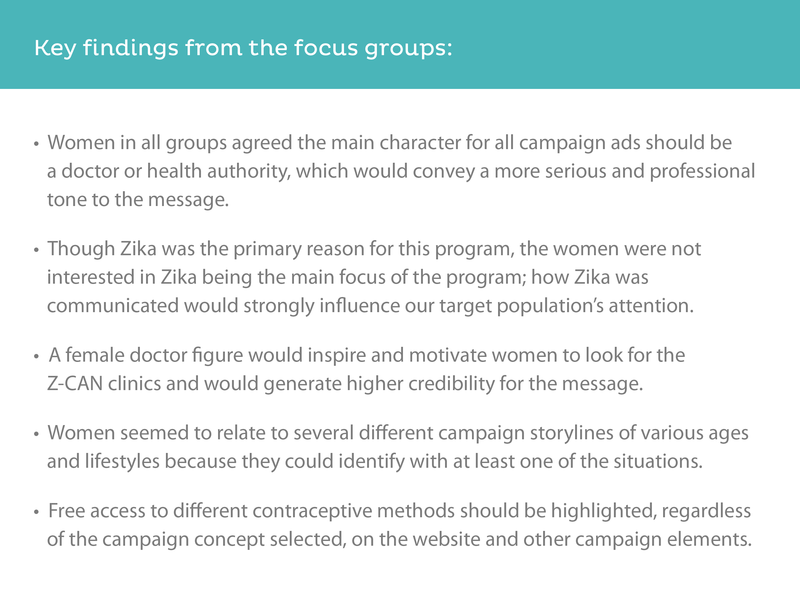 The Z-CAN team determined that communications should feature meaningful and personal messaging and relevant tactics that were true to the target population’s values, and that took into consideration their current behavior related to contraception and cultural and social influences in their lives. That finding led directly to formation of Z-CAN’s health communication campaign concept, ALDP, which validated the uncertainty many women feel about birth control and normalized asking questions about contraceptive methods, while providing answers to the most prevalent questions. By empowering the women, ALDP helped them shift from simply following what others were doing, to being well informed and able to choose what was right for them. 4.4 What Is the Best Way to Reach and Engage the Audience? Now that you have a clear understanding of the target audience and you have the communications platform, you can develop specific content—the right messages for the right contexts (when the target is most receptive or when or where it is most critical to deliver the message). Effective consumer communication engages the audience in a conversation, provides valuable information, and prompts action. Program content must be interesting, credible, meaningful to the target and disseminated in relevant environments. Spokespersons and influencers must be authentic and believable. For Z-CAN we developed ALDP as the platform campaign under which we included specific messages for specific purposes. The brand established the overall story and provided a consistent look, feel, and tone for all communications. Specific messages addressed different audience situations, seasonal contexts, methods of contraception, and key questions to ask the doctor, in a mix of emotion-driven messages and fact-based educational messages. Four relatable personas of different ages and marital status were developed for the ALDP campaign. 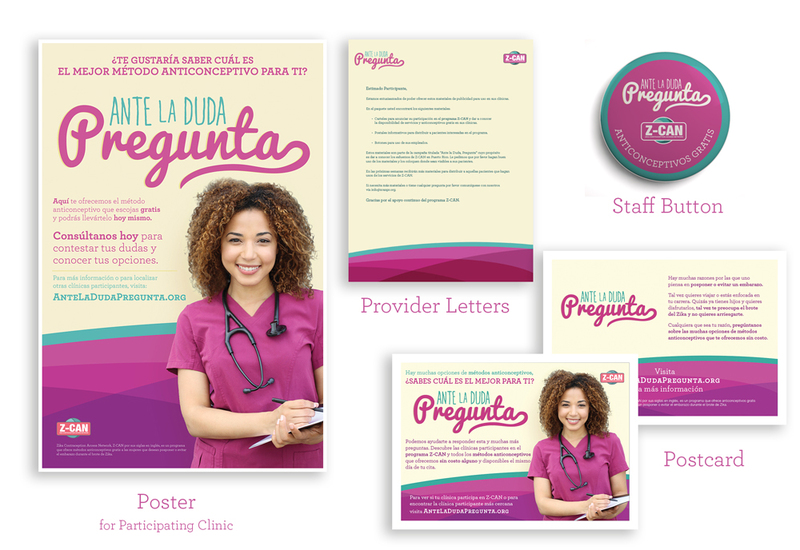 These personas shared their experiences and encouraged behaviors such as visiting a clinic to learn about contraception options available to her. We monitored the performance of each message on digital platforms (Facebook and Google/YouTube) and developed new messages based on the learning. Owned: These are communications channels owned or controlled by your organization, for example, your website, Facebook page, proprietary events, or any facilities and locations you control. Earned: Securing presence in other media that does not require paying for the space (such as a public service announcement [PSA] or press coverage) or establishing partnerships with other media is also efficient and can add credibility. Paid: This necessary component ensures your message is seen by the right audience(s). It can include boosting (promoting) social ads, digital display ads, paid search, TV, radio, print, or outdoor advertising. For the ALDP campaign, we needed a website hub for information and resources, presence in social media, presence in the community (including doctors’ offices), and presence in print and digital media. Owned: The ALDP website and ALDP Facebook page were our primary owned channels, requiring the greatest investment of time and money; we also created and distributed provider materials. 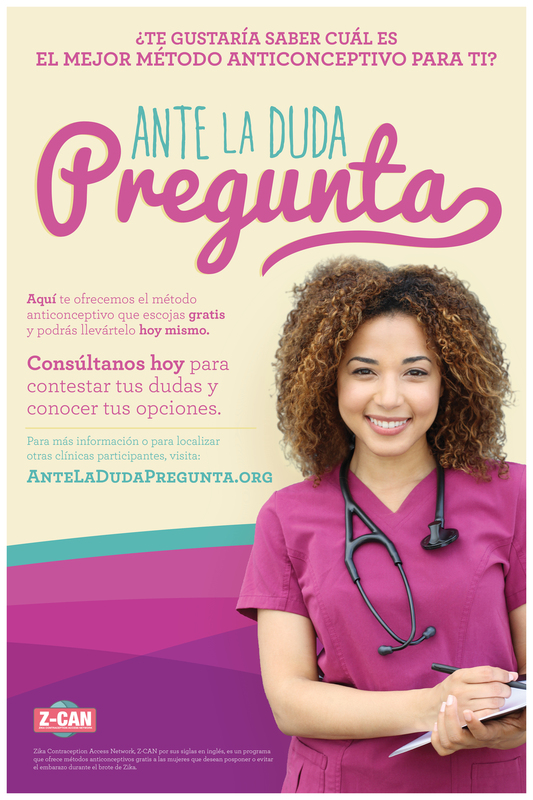 Our Spanish-language ALDP website hub (with an English toggle) for consumers included educational text and video content on contraceptives, a clinic search feature that allowed women to locate a Z-CAN clinic/provider, frequently asked questions (FAQs), and testimonials. to inform and educate the target population on the access to free contraceptives through the Z-CAN program. It also was a hub for recruiting, engaging, and activating influencers (paid and unpaid). 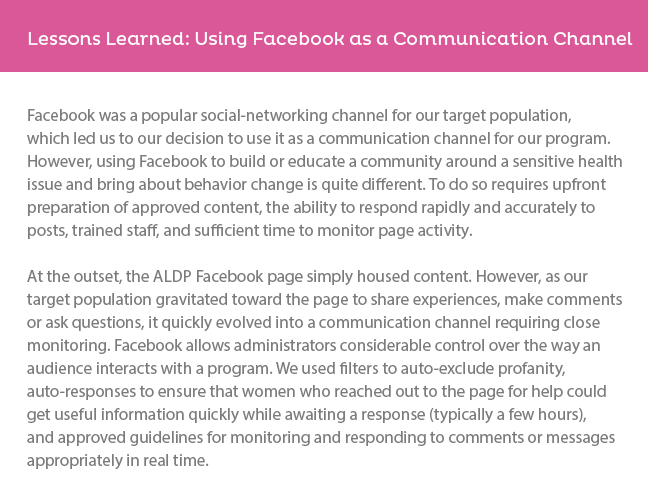 To ensure accuracy and consistency of responses via Facebook messages or comments, community managers developed Response Guidelines that included pre-approved responses and a reference FAQ. 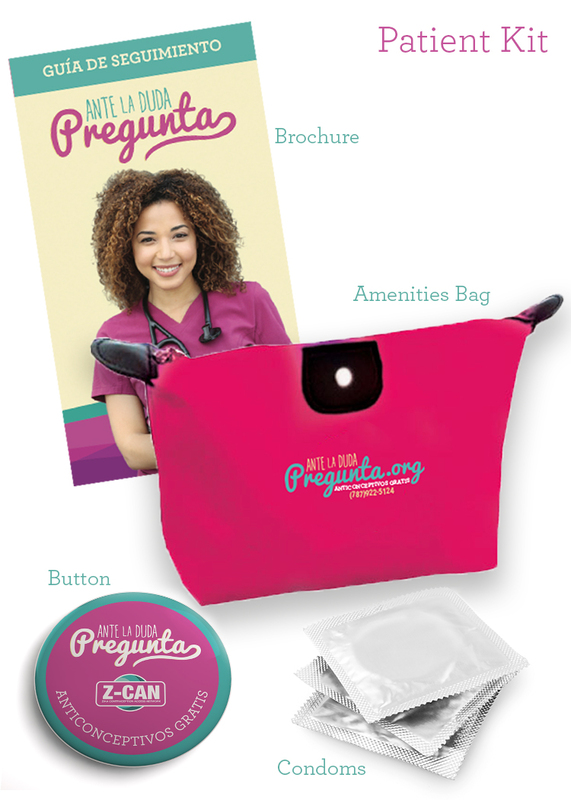 Programmatic Information: Providers received a welcome letter/kit, program updates, and Q&A talking points to ensure they were prepared to deliver Zika urgency message to patients—one that the campaign itself did not deliver. Clinic toolkits included ALDP posters, brochures, and handouts. Social Media Outreach: Initially the Z-CAN team hoped to include physicians' social channels as part of the plan. Unfortunately, few physicians actively used social media. Earned: Establishing partnerships with entities, including relevant news media outlets, that reach the intended audience(s) can be a highly efficient way to secure coverage and build support. Reaching out to social media influencers, member organizations, and other entities who cover relevant subjects can lead to partnerships that extend the reach of your campaign. Influencers who choose to cover your program or event to support a social cause or for some other reason and are not paid fall into the Earned category. Influencer programs can provide a reduced cost and more effective alternative to traditional celebrity or media endorsements. The key to success is creating content that encourages influencers to share with their networks. Influencer programs are an element of paid social media when the influencers are paid for their posts on their social channels, but influencer programs can also be nonpaid (if influencers decide to support something they believe in). 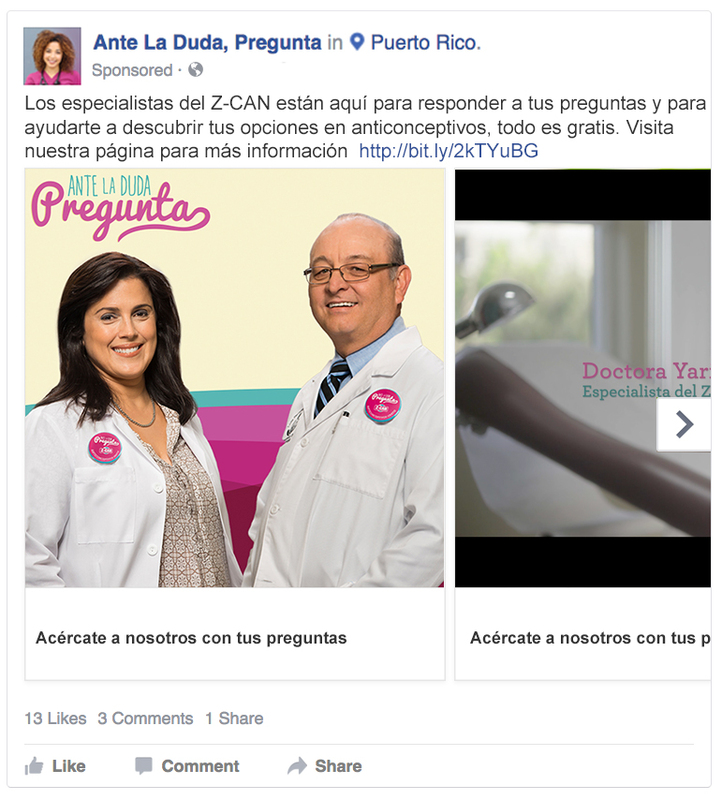 To amplify ALDP campaign messages, we identified and recruited Puerto Rican influencers and bloggers as partners. Only a few of the influencers were in the health care arena, but many were invited to join as partners due to their audience’s similarity with that of the ALDP. The team worked both with influencers who were compensated for their social media posts and content they created, and unpaid influencers who created content based on a passion or interest. We provided each influencer, whether paid or unpaid, language on the campaign and example social media posts that they could disseminate through their social media channels (Twitter, Facebook, Instagram) and their blogs. The influencers also received campaign updates, highlights of events, and additional campaign materials, including videos and imagery they could use in their posts. Community engagement: Community buy-in should be a crucial part of any major cause-related or behavior-change effort. A well-thought-out community engagement plan creates efficiency, helps maintain interest and engagement in the program, and reduces the need to rely on paid media. Community events are a way to extend the reach of a public health campaign by bringing the message to venues where the target lives, works, or plays. Alignment with local nonprofit organizations and community centers lends authenticity, credibility, and trustworthiness to the project. Community engagement materials do not have to be costly; handouts, giveaways, and postcards all can be effective communications means for events. The ALDP effort included grassroots community-engagement events in various settings throughout Puerto Rico, with the goal of extending the campaign’s reach. Staff attended a range of community events promoting the ALDP campaign, including health fairs, festivals, marathons and walks, presentations to community groups, and on-campus events at universities. Women in the area had the opportunity to meet the local Puerto Rico Z-CAN staff, learn more about the Z-CAN program, and ask questions. Attendees received materials to educate them about the Z-CAN program and to increase program recognition. 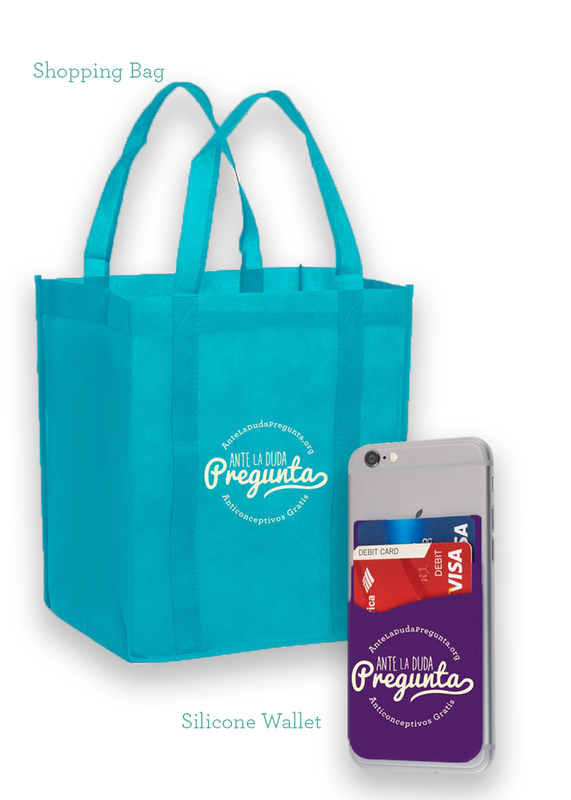 We created ALDP-specific promotional materials to recruit and educate potential participants: posters, grocery shopping bags, button pins, and phone wallets with credit card slots (see images below). Paid: Developing a targeted media buy across digital and broadcast channels, while costly, is a guaranteed way to reach specific audiences. For the ALDP campaign, we used radio spots, PSAs, live DJ mentions or live reads, and on-air interviews. Unlike many major markets in the United States, radio stations in Puerto Rico were not measured, so the team had to determine alternate metrics to monitor performance of this channel. We looked at airtime and number of spots run as a proxy for impression levels (the average number of people estimated to have been listening to the radio station during the time when the radio ad aired). Two primary ways that can ensure your communication reaches the desired audience on social media are: (1) boosting/promoting posts and (2) paid ads. Boosting or promoting posts is a great way to maximize the visibility and reach of content you have already published through Facebook or Instagram, and if you are able to monitor performance of past posts, this can be a good way to focus your media spend on messages that have already shown strong performance (engagement, reactions, shares, link clicks). Paid ads enable a communications team to quickly and efficiently test multiple different messages or versions of an ad (different calls to action, images, or proof points) and use the version that performs best. ALDP created a master calendar of both organic posts and paid social ads to ensure efficient spending of the overall social media budget, and to ensure that the body of content told a story across the entire length of the campaign. We needed to ensure we had different paid social ads or promoted posts targeting distinct parts of the overall target audience in Puerto Rico at different times. We also planned a video content calendar, running our videos first as ads, then posting the best-performing videos to our Facebook page. ALDP grew a Facebook community from 0 to over 25,000 followers. Google also can be a strong partner for digital campaigns. Google offers business tools through AdWords and Analytics that enable users to create, place, and monitor performance of range of advertising types, and link those ads’ performance to specific actions on the campaign’s website. 4.5 What components should be part of campaign measurement and evaluation? Measurement and evaluation contribute to long-term program success. Solid behavior-change programs incorporate frequent review of results and subsequent modification of messaging and tactics to increase program effectiveness and sustainability. Consumer Journey: Identify the key behavior change desired and the steps an individual or community would take that support progress toward that goal. Identify key opportunities where communication could positively influence progress toward the behavior-change goal. Logic Model: For the behavior you aim to change through use of a communications campaign, identify the short- and intermediate-term outcomes that will result in the behavior change and the communication activities and outputs needed to achieve the outcomes. 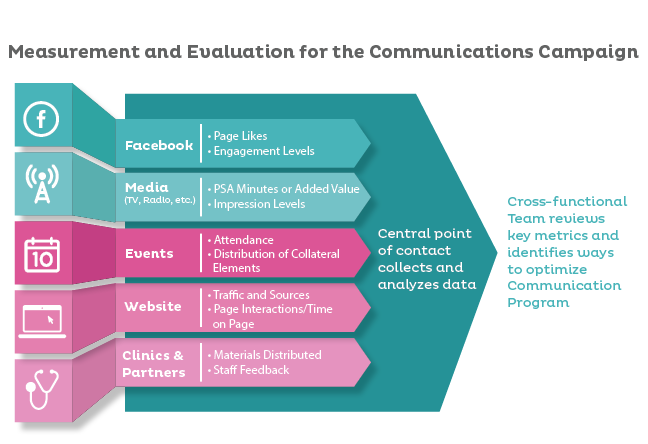 Evaluation Plan: Develop evaluation questions, key metrics, and data sources for monitoring campaign progress and assessing effectiveness of the campaign. In addition, agree on frequency for collecting and reviewing campaign metrics and identifying opportunities to improve the campaign or make adjustments based on collected data. Centralized Data Collection: Identify a person responsible for collecting data for each metric in the evaluation plan. See ALDP M&E Logic Model for how measurement and evaluation were incorporated into a health-services program. For the ALDP campaign, the team analyzed metrics to ascertain numbers and geographic distribution of clinic searches, positive vs. negative responses, and strength of message and medium. Results were used to tweak various campaign elements as well as to identify new content needs or address frequent concerns.